Video games have a unique way to tell a story, because of its interactive nature. Stories have a way of sticking with the player long after they’ve been told in this manner. This is one of the reasons why developer Lienzo has been hard at work making the upcoming action adventure game Mulaka, which tells stories from the indigenous Tarahumara tribe in northern Mexico. I played the game while at Sony’s PlayStation Experience 2017, and our preview is now ready for you below. Mulaka’s main campaign tells a popular story in Tarahumara culture. The world has been destroyed and re-created several times throughout history, being reset when the gods deem that the world has become too corrupt. Those gods are now debating whether it is once again time to reset. The player becomes a Sukurúame, or Tarahumara shaman, who can commune with the demigods throughout the lands in an effort to convince them that humanity is worth saving. 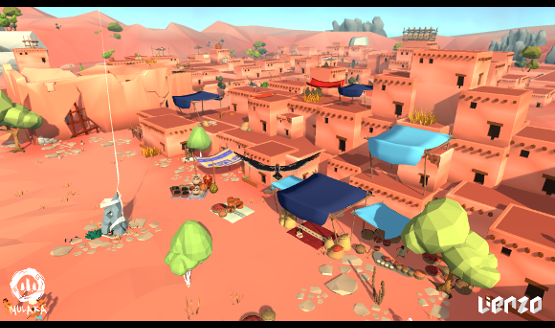 Mulaka is built using the Unity Engine. Developer Lienzo has opted to go for a minimalist graphical style. Thus, the environment, player character, enemies, and all other assets are all purposefully low-poly. Lienzo claims that choosing this rendering method instead of going for ultra-realistic allows them to portray the vast areas of Mexico that they are showing, without giving up any fidelity. They are correct in that you can tell the size of the various trees and large rocks in the environment, despite their shapes being simplified and colors limited to just a few. But better to go with a highly stylized, implied rendition, than an extremely expensive, higher-resolution asset that won’t be seen for very long anyway. The look fits the ethereal mood of the game, and it’s hard to imagine Mulaka looking any other way now. 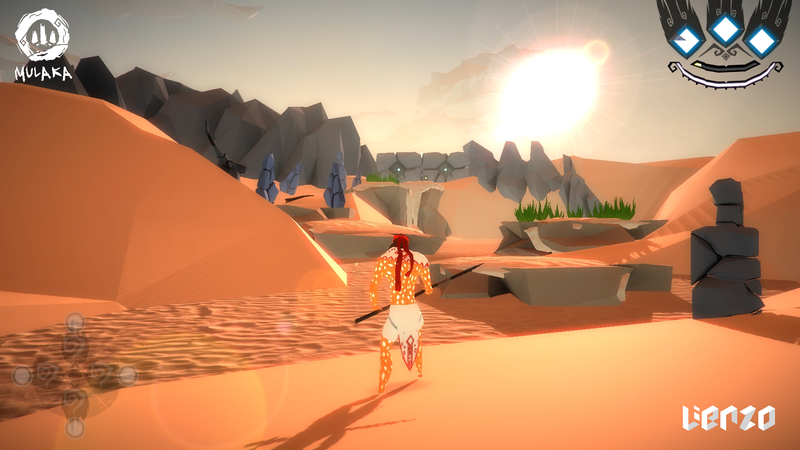 Mulaka uses a soundtrack produced with traditional Tarahumara culture in mind. This includes music unique to the region, produced using real instruments, and even authentically recorded Tarahumara dialog. If Lienzo gets the audio right in Mulaka, then it’ll feel quite jarring to receive a PSN notification as you take down a fearsome mythological beast from the Tarahumara folklore. The breadth of combat options available in Mulaka are more than is apparent upon first observing the game. While there are light and heavy attacks, the Sukurúame can also transform using powers given to them by various demigods encountered throughout the campaign. The transformations shown during our demo included turning into a hawk, able to soar to higher locations with ease, and a bear, drawing on immense power to take down multiple foes at once. It’s a good thing those transformations were available, because the regular combat felt a bit stiff. Combat had a lock-on function, but it wasn’t always clearly working. Perhaps I encountered a bug, because locking on to enemies seems to be a must in a game where multiple enemies can come at you. It’s still early in the development cycle, and I’m sure things will be cleaned up in due time. Beyond active combat and transformations, Mulaka also grants the player the ability to craft special potions. Collecting ingredients for these potions is done by gathering them from wild-growing plants, not unlike the mechanic seen in Horizon Zero Dawn. These potions are drunk by the Sukurúame, who also dances as he consumes his work. The result is increased damage or even a shield which allows the player to pass through dangerous barriers unharmed. Mulaka is poised to teach those who pick up the game a thing or two about the Tarahumara people. Combat may feel a bit stiff, but this will hopefully get worked out before launch. Expect Mulaka to be available for download on the PS4 in early 2018.